Objectives: We designed and studied an online, video-based, lesson analysis professional development (PD) course focused on energy concepts. The first goal of the project was to enhance teacher knowledge and practice related to energy concepts to ultimately improve student learning. The second goal was to study the promise of efficacy of the various components of the course in enhancing teacher knowledge and practice and student achievement. Theoretical Framework: The facilitated online PD course uses a two-faceted theoretical approach: situated cognition and constructivist learning theories. According to situated cognition theory, learning is tied to authentic activity, context, and culture (Brown, Collins, & Duguid, 1989). Meanwhile, the constructivist approach to PD allows teachers to grapple with their own prior conceptions about energy, develop explanations from evidence within a coherent conceptual framework, and reflect on their thinking as their conceptual understanding develops. Student Outcomes: Our study used a cohort-control quasi-experimental design. Teachers participated over two school years. Teachers’ students in the first year constituted the comparison group, and students in the second year constituted the treatment group. Teachers took the online course in the summer between the two school years. We used this design to understand how teachers’ participation in the course might have enhanced students’ understanding of energy concepts. Teacher Outcomes: We used a pretest-posttest design. Our instrumentation allowed us to make direct comparisons to a related face-to-face PD for elementary teachers. We also used computer mediated discourse analysis (CMDA) to better understand changes in teacher outcomes. We recruited 35 teachers from across the U.S. to participate in the project. Students: Our data sources included a content assessment (pretest and posttest) for both treatment and comparison groups. Teachers: Our data included pre and post knowledge assessments and pre and post classroom videos. We scored classroom videos using a rubric from a related face-to-face model of PD. One knowledge assessment was identical to that from the related face-to-face PD. Results: We found significant changes in teacher knowledge, an increase (n.s.) in teacher practice scores, and a positive coefficient (n.s.) for the treatment effect related to student achievement. Tables 2a-2h summarize the results. The CMDA indicated that teachers with negative feelings about lesson analysis had lower achievement. Scientific or Scholarly Significance: Despite rapid expansion of online PD, little is known about best practices for its design and implementation (Dede et al., 2009). Our field lacks evidence linking PD of any kind to student learning. We improved on the status quo by rigorously examining student learning associated with the online teacher PD. 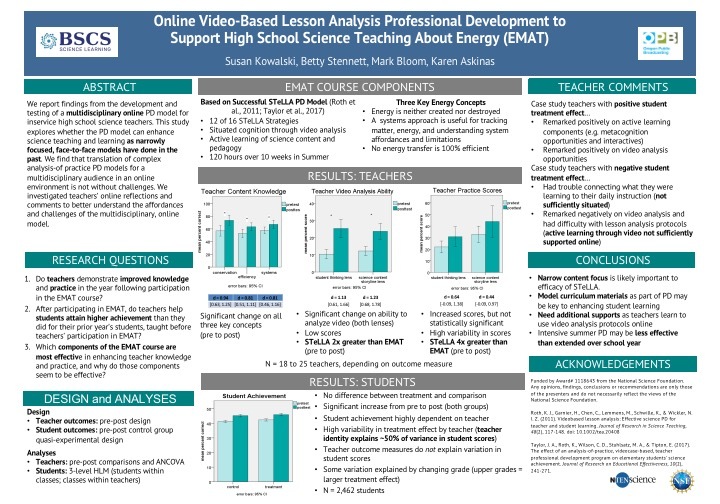 Video-based lesson analysis PD is an emerging field showing great promise (Roth et al., 2011). Video-based lesson analysis PD has historically been face-to-face, requiring substantial monetary resources. This study investigates the promise of efficacy of a facilitated, online, video-based lesson analysis PD course. It moves the field forward in terms of advancing our understanding of the affordances and challenges of online PD.